Effective January 2017, the California notary per signature fee increased from $10 to $15 for the first time in over 20 years! That's a 50% increase which is the highest raise I have ever received; when I worked for Corporate America my largest increase was only .35! Hopefully, other states will follow suit because across the country the notary fee varies widely, as it can be as little as $2 per signature. I am not sure how anyone can make a living on $2 a signature, but that is the fee in several states such as Arizona, Idaho, and Georgia. 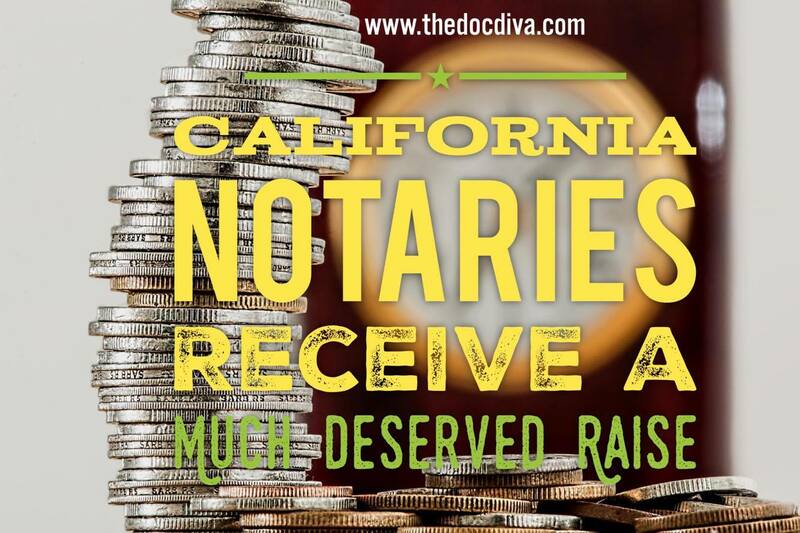 Thankfully, California recognizes the value that notaries provide and the liability we take on. As a notary, you are personally responsible for your errors. Anytime you perform a notarization you open yourself up to litigation. Even though you are an officer of the state, the state does not provide any protection against lawsuits. Personally, I have never been called into court though some of my colleagues have. With that said, law enforcement and attorneys have contacted me over the years about a few notarizations that ended up in their hands. A fellow notary was sued after someone illegally copied his stamp and forged his signature in a real estate transaction. It was only due to his personal errors and omission insurance that prevent him from being dragged into court. With the personal liability that's involved in being a notary plus the cost of doing business, the increase came at a perfect time.